Published by: (Unknown), Arxon, Bello Games New York, Inc.
Rummikub is a tile-based game, combining elements of the card game Rummy and mahjong. Every turn you can use your tiles or take a new one from the tile pool to make either Groups or Runs. Groups are formed by at least 3 tiles with the same number, but different colors. Runs consist in at least 3 tiles of the same color and with consecutive numbers. 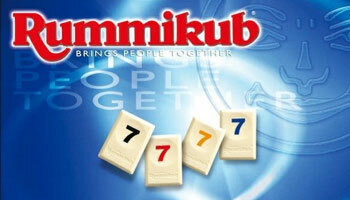 Unique for Rummikub is that players can work with the tiles that have already been played. There are 104 tiles in 4 colors and two jokers. The colors of the numbers on the tiles are like card suits. The goal is to be the first to eliminate all the tiles from their rack. The players must puzzle out their best combinations and when more tiles are in play, the options becomes challenging and complex.